Today was an awesome day. I bought my first car. 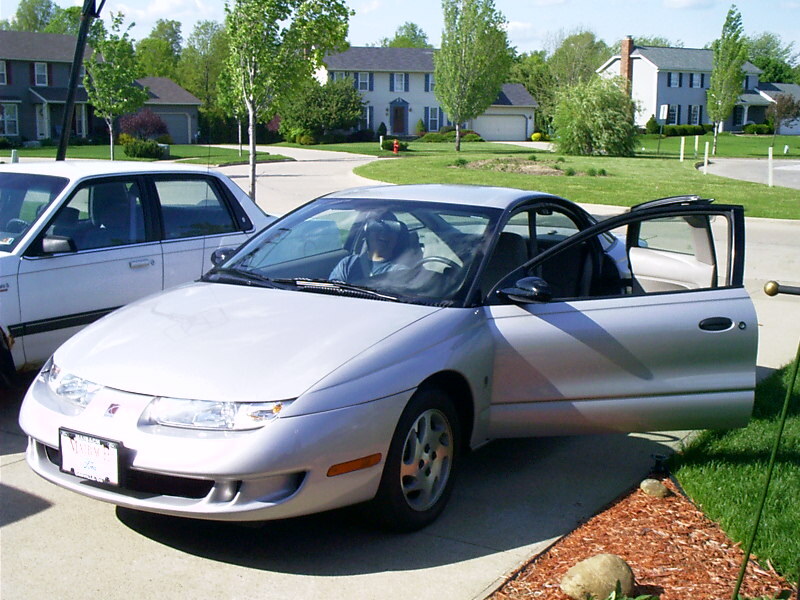 It's a 2000 Saturn SC-1, as you can read above. Only cost me $7700.01 after taxes and fees. It's really nice, but its lacking in some features. It doesn't have power windows or power locks, and there's neither a CD player nor a tape deck, just a radio. That's not bad for now, but I am going to put in a CD Deck which I have yet to buy. Hammonds is gonna help me install that and I thank him in advance. But that's not for another 3 weeks or so. The stock speakers are pretty decent, so I'm going to hold off on buying subs for a while, but a CD player is needed, definitely. There are hardly any scratches on it for a 3 year old silver car, and Dan even thought it was brand new . I can see why he thought so because it's such a nice car. There's an obscene amount of trunk space which is gonna own for LAN parties and subs and stuff. There's probably more room in the trunk than in the back seat. Oh yeah, and there's 6 cup holders for 4 seats. Heh. So anyways, Whempys is this weekend and I believe the group is me, krhainos, and swiftwulf. This should be a good test of the car's long range capabilites. Assuming we take my car because jo's is small and tim's is messy. :D Hopefully we can play a lot of battlefield 1942 there. I love that game. I'll add more pics of the car tomorrow, but I'm going to Six Flags to hopefully get a job there.